As a manager and team leader, your ability to keep an open mind when it comes to managing complaints is critical to the morale and success of your team and organization. Complaints highlight your team members’ frustrations and/or distractions. Avoiding them can negatively affect productivity across the company. Most employees don’t enjoy complaining, so when you are approached with a complaint, it is typically a cause for concern. 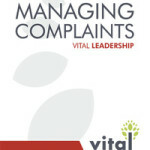 Knowing how to listen to and resolve complaints is a critical skill to ensure your team members feel valued, understood, and supported, which ultimately leads to greater job satisfaction and increased output.The Vital Learning Managing Complaints™ course provides managers and team leaders with a proven process and individual skills to effectively deal with employee complaints in a way that supports employee and team goals. This course illustrates the importance of managers and team leaders listening to team member complaints and remaining non-judgmental. A critical skill because what might appear to be a minor issue to the manager may in fact be a major problem to the team member. 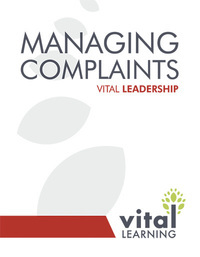 Click on the “e” to immediately enroll and begin the Managing Complaints online course.